A general purpose Stroke implementation that can represent a wide variety of line styles for use with subclasses of Graphics2D. A dash array can be used to specify lines with alternating opaque and transparent sections. Indicates a flat line cap style. Indicates a rounded line cap style. Indicates a square line cap style. Indicates a bevelled line join style. Indicates a mitered line join style. Indicates a rounded line join style. Creates a new BasicStroke instance. Creates a new BasicStroke instance with the given line width. Creates a new BasicStroke instance with the given attributes. Creates a shape representing the stroked outline of the given shape. Compares this BasicStroke for equality with an arbitrary object. Returns the dash array, which defines the length of alternate opaque and transparent sections in lines drawn with this stroke. Returns the dash phase for the stroke. Returns a code indicating the line cap style (one of CAP_BUTT, CAP_ROUND, CAP_SQUARE). Returns a code indicating the line join style (one of JOIN_BEVEL, JOIN_MITER or JOIN_ROUND). Indicates a flat line cap style. See the class overview for an illustration. Indicates a rounded line cap style. See the class overview for an illustration. Indicates a square line cap style. See the class overview for an illustration. Indicates a bevelled line join style. See the class overview for an illustration. Indicates a mitered line join style. See the class overview for an illustration. Indicates a rounded line join style. See the class overview for an illustration. width - the line width (>= 0.0f). IllegalArgumentException - If width is negative. Creates a new BasicStroke instance with the given attributes. The miter limit defaults to 10.0.
cap - the line cap style (one of CAP_BUTT, CAP_ROUND or CAP_SQUARE). 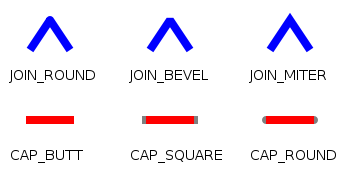 join - the line join style (one of JOIN_ROUND, JOIN_BEVEL, or JOIN_MITER). IllegalArgumentException - If one input parameter doesn't meet its needs. dash - The array representing the dashing pattern. There must be at least one non-zero entry. dashPhase - is negative and dash is not null. Creates a shape representing the stroked outline of the given shape. THIS METHOD IS NOT YET IMPLEMENTED. this object has the same width, line cap style, line join style, miter limit, dash array and dash phase as o.
o - the object (null permitted). true if this stroke is equal to o and false otherwise. Returns the dash array, which defines the length of alternate opaque and transparent sections in lines drawn with this stroke. If null, a continuous line will be drawn. The dash array (possibly null). Returns the dash phase for the stroke. This is the offset from the start of a path at which the pattern defined by getDashArray() is rendered. A code indicating the line cap style. A code indicating the line join style. Returns the hash code for this object. The hash is calculated by xoring the hash, cap, join, limit, dash array and phase values (converted to int first with Float.floatToIntBits() if the value is a float). BasicStroke.java -- Copyright (C) 2002, 2003, 2004, 2005, 2006 Free Software Foundation, Inc. This file is part of GNU Classpath. GNU Classpath is free software; you can redistribute it and/or modify it under the terms of the GNU General Public License as published by the Free Software Foundation; either version 2, or (at your option) any later version. GNU Classpath is distributed in the hope that it will be useful, but WITHOUT ANY WARRANTY; without even the implied warranty of MERCHANTABILITY or FITNESS FOR A PARTICULAR PURPOSE. See the GNU General Public License for more details. You should have received a copy of the GNU General Public License along with GNU Classpath; see the file COPYING. If not, write to the Free Software Foundation, Inc., 51 Franklin Street, Fifth Floor, Boston, MA 02110-1301 USA. Linking this library statically or dynamically with other modules is making a combined work based on this library. Thus, the terms and conditions of the GNU General Public License cover the whole combination. As a special exception, the copyright holders of this library give you permission to link this library with independent modules to produce an executable, regardless of the license terms of these independent modules, and to copy and distribute the resulting executable under terms of your choice, provided that you also meet, for each linked independent module, the terms and conditions of the license of that module. An independent module is a module which is not derived from or based on this library. If you modify this library, you may extend this exception to your version of the library, but you are not obligated to do so. If you do not wish to do so, delete this exception statement from your version.